While we are constantly reminded of how effective social media is, and that everyone who isn’t yet implementing it into their marketing strategy should do so right on the spot, a topic that is far less discussed but equally important is measuring the ROI of social media in order to understand what types of results you are getting from it – if any. What results am I getting? Is social media really generating any results? …Are common types of questions that often come up in this discussion. In fact, the statistics clearly show that there is quite some confusion regarding social media and ROI. 46% of B2B marketers say they’re not sure if any social channels have generated revenue for their businesses, and only a mere 13% believe they’ve been able to prove the results. While executing and actually working with your social media strategy, every now and then, you need to sit down and take a look at what you are actually getting from your social media efforts. That’s exactly what we’ll be talking about in this article. Measuring and seeing the results social media has been generated isn’t’ always clear as ice. The main reason to that is because social media is first and foremost about building relationships with your audience which will eventually lead to a conversion down the road. Even social media can generate sales right there on the spot, it is the long-term results that makes social media worthwhile. As a result, social media is not for the impatient. This often means that they’ll do what is good for them short-term on social media – which ends up damaging their long-term results. 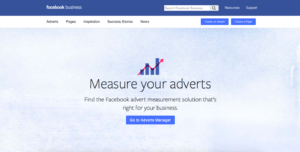 The tricky part about social engagement is, as mentioned, that it isn’t as easily measured as other marketing sources – such as Facebook ads. On Facebook ads, you put out an ad, it generates a click, and that click can then be traced to a sale. But that rarely happens on social media. In fact, Google gets a lot of credit they don’t deserve. Google is that person who always jumps in at the end and says the punchline, then gets all the credit for the joke. When you share content and interact with your followers on social media, you are impacting them at a very small scale. This means you probably won’t convince them to buy from you – because why would they? – They don’t know you! But as you are interacting with them on a regular basis, and they get reminded of your existence with your posts, and as a result, several weeks, months or even years after you’ve interacted with them, they’ll come and think of your brand – and where do they go? They’ll go to Google and search for your brand, then click through to your website. And this is something to be very aware of, because sure, Google is the one getting credit for generating the traffic, however, it was thanks to social media it was generated at all. This is the truth. Unfortunately, though, it means that a huge share of people are missing out on social media’s tremendous power just because they are too eager. This is especially common in influencer marketing (which is a form of social marketing) and I come across it all the time! Brands who’ve just run an influencer marketing campaign that says “but we only got 1 sale from it”. Yes. Within the first 24 hours! Social media marketing is a long-term relation- and trust-building tool! How long does it take to build up trust in a person to the point where you’d give them your money? Sales can take weeks or even months after an influencer campaign has ended, and the same principle goes for regular social marketing. Apart from sales as a metric, social media and influencer marketing has a ton of other benefits that many marketers seem to ignore when measuring the value of social media. We’ll go more into detail of these further on, and break them down one by one, but let me tell you – there are plenty of metrics social media stimulates, apart from just sales. Again, the people who only look at sales are sacrificing their long-term results for short-term quick-fixes. And I’m repeating this because if you recognize yourself in this, the mindset has to go in order for you to reach your true potential in social marketing. Before you can measure your goals, you first need to define them. And if your main goal is to generate sales, that is fine! you just have to be aware of the fact that you can generate sales from social media long after the initial interaction took place. Your goals might include all of these, or they might just focus on one of these goals. What is important to know is that your social media results will look different depending on which of these you have had in mind when working with your social media. This is one of the most common social media goals, and of course, some social platforms will be better than others for this. For example, Instagram doesn’t allow you to share clickable URLs in your captions or in comments, which can be a bit of a hazard – as opposed to Twitter, where links are an important part of the platform and how people use it. According to a report, social media is now the number one driver of all website referral traffic. As of December 2014, roughly 31% of referral traffic was generated from social media. This just goes to show how powerful social media has grown to be in terms of traffic generating potential. 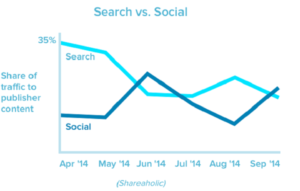 What’s more, in the graph below created by Shareaholic, you can see a negative progression of search traffic, while social media traffic referrals have risen above search in June, and again in September. It’s not really a secret that social traffic referrals are tremendously important for many brands. And they can be for you as well! The trends show that there has been a shift in how individuals consume and look up information and content. This, in turn, has lead to social media growing stronger and more powerful, and something that brands should no longer neglect. There is also a benefit of the traffic generated by social media. When people choose to continue to your website from social media, they have already gotten familiar with your brand, and can even choose to follow future updates from you if they wish to do so. On search, you are hoping that one website visit will do the trick of a conversion (which it usually don’t), and if it doesn’t, you’ll have to rely on your audience remembering your brand and website so they can visit it in the future (which they normally don’t either). Thanks to social media and the fact that people now can start following you, they’ll constantly get reminded of your brand’s existence, leaving you always on top of their mind and never forgotten – dramatically increasing the chances of a conversion further on. Lastly, as social media helps build trust, the traffic generated from it will be far more valuable than traffic generated from search, where the visits to your website often are the first encountering people have with your site. There are quite a few ways you can study traffic from social media on, but this also depends on which social platform you are using. 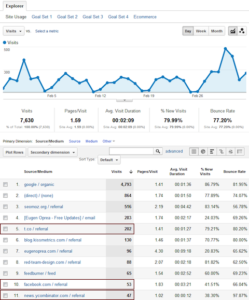 The first way to traffic is by using Google Analytics. The tool will give you rich insights into where your website traffic is coming from, as seen below. The second method to track website traffic is to use the built-in analytics tools across the social platforms you’re using. Of course, not all social platforms offer analytics, but more and more platforms have implemented it over the last couple of years simply because a lot of people have been requesting it. If you have converted your Instagram account to a so-called business account, you’ve now also got access to analytics that lets you see how many people have clicked your website link that is located in your bio. Because the only places where you can implement website links on Instagram is in your profile and on your Stories (and on Direct Message), tracking the number of clicks isn’t a very big challenge. To see the website clicks on your profile, the analytics icon in the top right corner of your profile. On the first statistics bar, slide to the left until you find website clicks. Here, you’ll see the total number of clicks to your website over the last week. One way to measure Facebook traffic is to use Google Analytics. Once again, it is a super powerful tool that will present you with rich insights about the traffic you’re receiving. This is one of the most popular methods of traffic exactly where the traffic came from. With tools like Bitly, you can convert a regular link into a personalized one which lets you track all the clicks that are coming from that link. Shorten links, measure results, and optimize. With Twitter’s own URL shortening service, t.co , you can now track website traffic from Twitter without having to use services like Bitly. Because all traffic from Twitter now goes through t.co, it is now much easier to track traffic and leads because they’ll end up as referral traffic from t.co in your web analytics. Statistics have many times proven how effective social media can be for generating sales. We’ve also seen how powerful social media is for driving traffic. However, it is what happens with that traffic that is the big question. 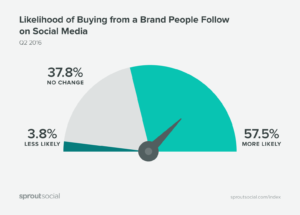 This image from SproutSocial shows the likelihood of buying from a brand that people follow on social media. As you can see, 57.5% of people say that they are more likely to buy from a brand that they follow on social media. That’s quite a significant number. Of course, your sales won’t go up because people start following you. They don’t get impacted by just tapping the “Follow” button. It is what follows after they tap it that will have the biggest effect. The content you share, the trust you gain, and the interactions you have with them. Those are the real metrics that makes people more likely to buy. And if you think about it, it’s not strange by any means. Those who aren’t following you on social media have fewer interactions with your brand. When they have fewer interactions with your brand, you cannot increase their trust in you, thus making it less likely that they’ll buy from you. But the route to getting there isn’t. In order to convert your followers to customers, you need to share amazing content, present yourself as a leader in your niche, and last but not least: engage with your audience on a highly personal level. When you do that, that’s when you’ll start to see results. Oh, and don’t forget patience! Trust doesn’t come over night. 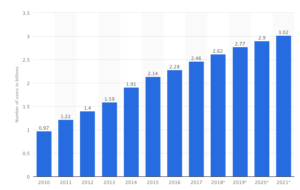 There are 4.45 billion social media users today, and Statista expects that number to reach 3.92 in 2021. Of course, you’ll be able to find people who are interested in your niche and brand. It would be incredible strange otherwise. As a brand, you don’t want to spend your efforts on building relationships with people who aren’t interested in the niche you’re in, or what you are sharing. It is better to focus on putting all your effort towards building relationships with people who really matter, and are your potential customers. As we discussed earlier, social media’s main advantage is not that it can drive sales super quick and generate tons of revenue over night. The benefit of social media is that it lets you come close to your audience, and where they spend their time, opening up for a completely new way of engaging with them. You’ll get some kind of indication of how many you’ve built, and how many loyal followers and brand supporters you’ve gotten as a result. While it may sound like a silly metric, it’s actually extremely valuable and important. Happy customers and brand supporters work as your brand promoters without asking for anything in return other than that you treat them with respect. Succeed in treating your audience correct and you’ll get rewarded for it. Social media is a tremendous tool for understanding your current customers. Many individuals take their brand experiences to social media and share them with their friends and peers, and that’s why social listening is so important to see how you are performing, and what customers think about you. Also, when it comes to customer service, social media plays a vital role. 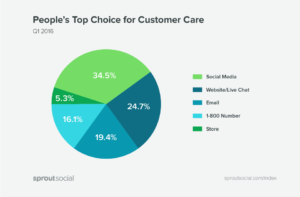 In fact, SproutSocial found that social media is the top choice of consumers for customer care. With a number that high, not having social media at all would mean missing out on both praises and complaints. We know that social media is many customers’ favorite tool to engage with brands, therefore, it’s important for the brand to be there. Solely being there and engaging with your existing customers can lead to them doing more business with your brand. When seeing the value of retaining customers instead of looking to always acquire new ones, it’s quite remarkable differences. Of course, for obvious reasons, you should look at acquiring new ones at the same time that you are managing your existing customers, but if you aren’t putting any efforts into retaining your current customers, that has to change. Quickly. The probability of selling to a new prospect is only 5-20%, while the profitability of selling to an existing customer is 60-79%. I think it’s safe to say that you should put the same amount of effort into retaining customers, if not more than you are putting into acquiring new ones. As we can see, the value of social media is quite significant for brands, and if you were hesitant about social media before you read this article, I’d be shocked if you still are. The are many metrics that can be used to measure the ROI and value of social media, and the ones presented and explained should be able to give you a better understanding of how you can look at the different metrics to see what results you are generating, and also get a better understanding of how you can use them to your advantage.